According to recent statistics gathered by Accident & Emergency departments, almost 40% of all accidents involving children under the age of five, are direct results of falling when running, walking or going down stairs. Of these, a huge 76% of children who fall downstairs, result in having head injuries - which is a pretty terrifying thought! 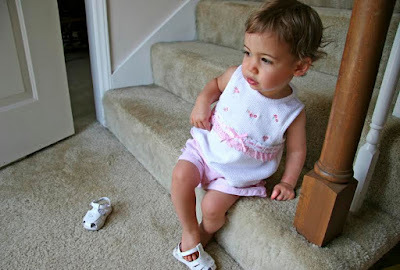 When the stair part specialist at Richard Burbidge got in touch to see if I would be interested in sharing their advice on child stair safety, I couldn't really refuse as I think everyone should be aware! Under Part K of the Building Regulations, which covers government guidelines on protection against falling and collisions, guarding - such as balustrades, must be fitted on flights of stairs and landings with a drop of 600mm or more in all UK homes. In all homes lived in by children under five years of age, staircases and landings should be designed to prevent children becoming trapped in, or readily being able to climb through the balustrades. Known as the 'baby's head rule', Part K advises trying to pass a 100mm sphere through the gap to ensure its safety. Horizontal, panelled stair balustrade, or 'ranch style' stairs can be particularly dangerous, as they are easy to climb and even easier for a child's head to become trapped between the panels. The style was outlawed in the 1985 Building Regulations, however, they still remain in many homes, so take the time to check the style of your stairs. To make sure your stairs are toddler proof, consider investing in a tradition stair gate. Stair gates can be installed at the top of stairs to prevent dangerous falls, or installed at the bottom to discourage little ones taking on great adventures. Stair gates can easily be attached to the wall, as wall mounted stair gates, or fitted with adjustable screws between the wall and newel post. On top of this, the Royal Society for the Prevention of Accidents recommend installing a second handrail at a lower level, so that little hands can grab hold, whilst gaining their confidence walking up and down. On hardwood stairs, a carpet runner is also a good idea as it provides added grip, which helps to stop accidental slips and slides. To ensure your little ones stay safe and sound, take the time to make sure your stairs are up to scratch today.